TubeTV allows capturing or absorbing videos on YouTube. These files can be then added to library and stored into the computer's hard disks. 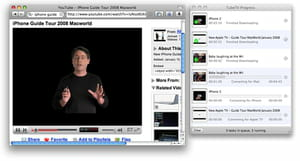 Capture: TubeTV has been designed for Mac users who require specific programs for capturing video from sharing websites such as Youtube. This action can be performed easily. The user has just to access the video URL and follow instructions for downloading the file. Settings: the handling of TubeTV is quite easy. The user is given the ability to adjust some parameters according to his preferences. For instance, he can define the destination folder of his choice or decide to keep the default one. Player: this application has a built-in media player. That allows playing back any kind of files downloaded from internet. It supports almost all media formats. We can cite among many others FLV, AVI, MPEG, MP4 and much more. TubeTV can be downloaded for free. It is easy to handle thanks to its simple and intuitive interface. There is nothing special to report. Latest update on May 7, 2015 at 12:23 AM.